The Marietta Makerstation has a 3 axis CNC wood router. I tried to use it last night, but hit a problem. The Mach3 software would stop every couple of minutes with an error "External E-Stop Detected." I found a fix for it. Under the Config >> General Settings menu there is a "Debounce" option in the upper right corner of the screen. I entered "125" here and this solves the problem. Explanation: The router has a lot of electrical noise. "A lot" is an understatement. When you turn it on, our doorbell rings. Occasionally this noise will cause the pc to detect a blip on the E-Stop input pin. The debounce setting tells the system to ignore e-stop input unless the signal is present for 125 * 40 microseconds, or 5 milliseconds. Here's the first part I've cut on that CNC machine. 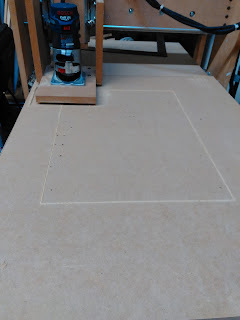 It's a backboard for the Wally 3d printer I'm making.